Think of your typical spa experience: a massage, pampering, first-class treatment across the board. Now, imagine giving your automobile the same type of treatment. And why wouldn't you? According to a study done by the Harvard Health Watch, the average American spends 101 minutes per day behind the wheel. With that much time on the road, your car or truck or SUV needs to be taken care of in the proper fashion. That's where the International Auto Spa comes in. "We offer a chemically balanced, high-tech experience which helps preserve the retail value of your car while helping to maintain its overall appearance," said Victor Young, CEO of BMW of Sarasota. "A lot of people live in subdivisions where you're not allowed to wash your car. At the International Auto Spa, we're providing financial and full-service solutions to problems such as those." "It's a high-class environment, but with regular prices and anybody can use it," said International Auto Spa General Manager Gary Roseboro. Located next to BMW of Sarasota, it offers unlimited club membership, meaning patrons pay once per month, giving customers the access to wash their vehicles as often as they like with no contracts. In addition, there's premium detailing, three levels of single wash or monthly unlimited plans (economy, plus, first-class) and 26 free vacuum stalls, which can be accessed any day of the week. Also, there's a customer lounge offering snacks, drinks, bistro tables and free Wifi, not to mention the facility is eco-friendly, using reclaimed water technology in order to reduce and recycle water. "Customer service is the first thing we focus on," said Roseboro. "With that comes attention to detail. We have the latest waxes, clean our facility brushes nightly and power wash the facility floors. Little things like that. We care, I care. I put that into my staff. If you take care of it like it's yours, there's a difference." Visit International Auto Spa ​in Sarasota for the ultimate auto detailing experience. They offer exterior washing services and premium detailing for a luxury treatment. Pick from a one-time cleaning or from one of their many club plans offering unlimited washes. Your clean car is just around the corner! 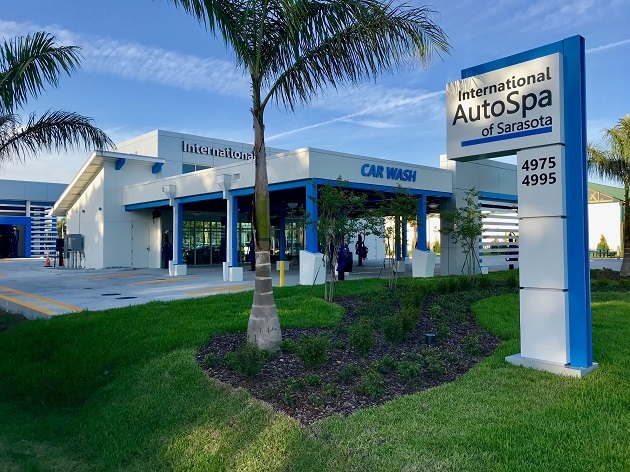 International Auto Spa is located at 4975 Clark Road in Sarasota. For more information or to make an appointment, call 941.960.2493.